BigStep Technologies is a full service software development company. We’ve worked with startups and enterprises across the globe to rapidly evolve ideas to products. Our product engineering expertize spans over various domains like web applications development, hybrid & native mobile applications development, real-time applications, microservices, cloud technologies, UX designing, etc. We work on the latest technologies, and this combined with the design-led, innovation-driven capabilities of our team ensures that we deliver great value to our customers. BigStep has a skilled team of Software Architects, Software Engineers, Designers, System Administrators and Project Managers. With the right mix of Products and Services orientation in our genes, we know how to make projects successful. We’re agile and are also always working on building new capabilities. Our Vision is to create a well known brand for ourselves in the digital technology spaces, with our products and services. Our mission is to empower big businesses and startups with software solutions and products for transforming their ideas into reality and enabling their growth. Our focus and attention to detail enables us to create highest quality products, and applications that are successful and sustainable. 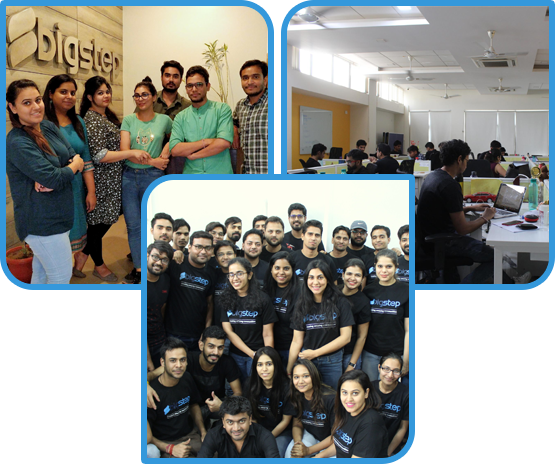 We love doing what we do and have deep domain knowledge to build cutting edge solutions. Our ability to create innovative solutions to complex problems adds value to our developments. We believe in creating valuable relationships. We're dedicated to customer success, creating value and serving the interests of our customers. We're honest and transparent in our approach. We have dedicated engineering, design, support, management and sales teams with functional experts in each of the functional groups. Technology architecture, workflow and UI / UX design. Coding, project management, deployment, launch. Fast, helpful and knowledgeable support.